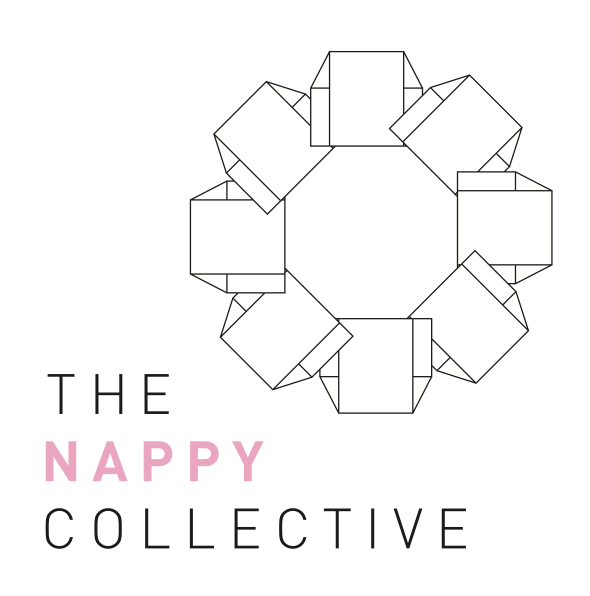 The Nappy Collective is such a fabulous thing to get behind. With my little girl growing so fast during her young years we have a bunch of nappies saved ready for donation to the Collective and can't wait to be able to help others in need. We'll be making sure we pop in some fresh nappies brought from the store as well as it's just such a great cause. The Nappy Collective will soon begin its largest drive yet in Australia, collecting leftover unused nappies in 11 cities and towns at over 130 drop points. From October 20-November 5, thousands of nappies are expected to be donated by the public in cities including Melbourne, Sydney, Brisbane, Perth, Adelaide and Alice Springs, as well as regional areas like Newcastle, Albury, Upper Hunter Valley, Ballarat and Geelong. At the conclusion of the drive, the nappies are then collected, sorted and donated to mothers in shelters and families in need in each locality. The concept behind the Melbourne based organisation is simple: many parents have a stash of outgrown nappies. Concurrently, mothers fleeing family violence often struggle to provide for their young children, often changing their babies less frequently or forgoing other basic essentials to afford nappies. The Nappy Collective (TNC)’s solution is to give parents an opportunity to collectively help families in crisis by donating their handful of nappies. Sandra Jacobs, founder, said, “We aim to make it simple and easy for many people to help struggling families in need through collective giving. Surplus nappies are often accumulated by parents as babies grow quickly from one size to the next, giving many parents a stash of nappies that would normally go to landfill. Donating unused nappies assists these families to focus on longer term, deeper care of their children by relieving them of short term challenges and stress”, she said. In the most recent drive in August, parents around Australia collectively donated a staggering 81,468 leftover unused nappies in two weeks. The nappies (mostly destined for landfill) were donated at 80 drop points in six cities around Australia. Collectives run three times a year and supply a growing list of over 40 organisations including welfare organisations and women’s shelters. Following strong demand in other cities, TNC’s aim is to continue to expand its reach for subsequent collectives. TNC was founded in October 2013 after Sandra found a stash of nappies her daughter had outgrown. Combining her passion of innovative philanthropy with a social conscience, The Nappy Collective held its first collective that month, collecting 1500 nappies in one drop point in Melbourne. The concept was successful, and with its organic growth and groundswell of community support, the model also proved its scalability to any town or city in Australia. 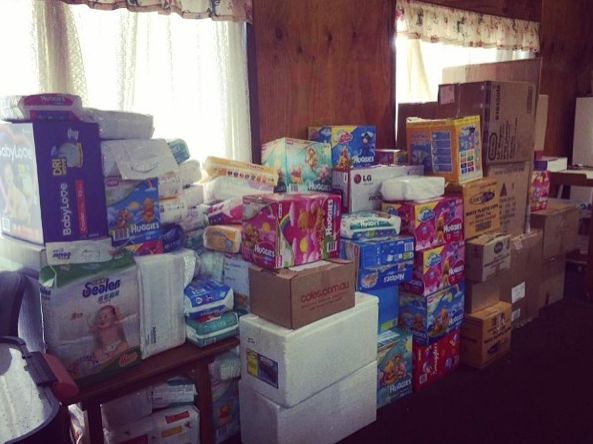 TNC’s previous collective in March 2014 amassed 26,682 nappies in Sydney and Melbourne. Family violence rates have reached crisis point in Australia and affect many families with young children. Statistics suggest one woman is killed every week by their partner and one in four children will witness family violence. In addition, research has demonstrated that domestic violence is a key cause of homelessness for women in Australia, creating an urgent need for material aid and support for mothers fleeing family violence. 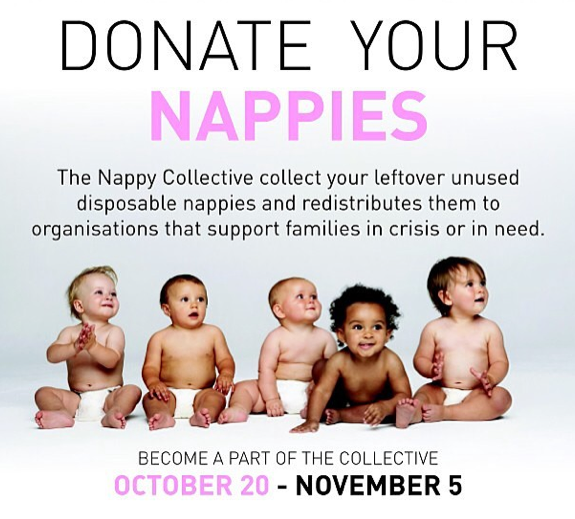 You will find all the drop off points where you can donate your unused, outgrown or brought nappy donations to: http://www.thenappycollective.com/ by selecting collection in the tabs. How did The Nappy Collective start? The Nappy Collective began in October 2013 after founder Sandra Jacobs found a stash of nappies her daughter had outgrown. At the same time, she had recently learnt of many mothers in shelters who struggled to cover basic needs for their young children, causing stress, financial difficulty and health challenges for babies. Combining her passion of innovative philanthropy with a social conscience, The Nappy Collective held its first collective that month, collecting 1500 nappies in one drop point in Melbourne. The concept was successful, and with its organic growth and groundswell of community support, the model also proved its scalability to any town or city in Australia. What are the logistics of the program? How are the nappies stored and distributed? In each city, the nappies arrive to a central location immediately after each collective is over. Local businesses provide storage and office space during this time. We then hold our sorting day as soon as possible. This is actually a fun and really rewarding day, with all our kids, family and friends coming together to sort nappies! Nappies are unpacked and then sorted by size, just like in the supermarket – newborn, infant, crawler, toddler, junior, pull ups and night time nappies, as well as swimmers (in Melbourne, for example, we donate swimming nappies to a program run by Melbourne Citymission for vulnerable young mums that runs swimming sessions for mums and bubs to encourage bonding for the mum and bub and infant development). We then count and re-pack the nappies by size ready to be collected by our beneficiaries. Some have special requests like a particular size they require more of. Our purpose is not to hold on to and store the nappies, it’s to get them out immediately to the families that need them desperately. Has your success inspired you to expand the operation? Due to wonderful support and engagement with parents around Australia as well as businesses that support our expansion, we continue to expanding with each Collective. Will The Nappy Collective be collecting other items soon? Our focus remains and will remain only on nappies, as there are numerous organisations collecting baby and kids goods, so rather than replicating their work, we collaborate with them and fill the gaps with nappies. Nappies are universal, most families have some spares or leftovers, and there is no screening or safety checks involved, requiring ongoing large storage space and teams of regular volunteers. We want to get the nappies out of people’s cupboards and onto little bums around Australia! Why are nappies so important to donate? Nappies are a basic essential child care need. A new born can require 10-12 nappies a day and toddler can require 6-8 per day. Families with limited incomes may have to choose between clean nappies and other basic needs such as food for themselves. Lack of frequent nappy changes can cause subsequent health issues and can be very distressful for an infant, potentially compounding an already stressful situation. Low income families may also not have the opportunity buy in bulk resulting in an inequality of spending power. By donating leftover unused nappies, families receive material aid that can reduce a financial burden and assist with healthy growth and development of their children in early childhood. Parents have more time to focus their energy on their parenting and other daily challenges they face. The nappies collected are distributed to local organisations within each collective city that support families in crisis or in need such as women’s crisis shelters and refuges, mothers facing homelessness, parenting support organisations and community organisations. To date, The Nappy Collective has distributed nappies to over 40 organisations nationally. These include Melbourne City Mission, Barnados Australia, Benevolent Society, McAuley Community Services for Women, Whitelion, Good Shepherd, St Kilda Mums, Eureka Mums, Geelong Mums, Kogo and Caroline Chisholm Society.